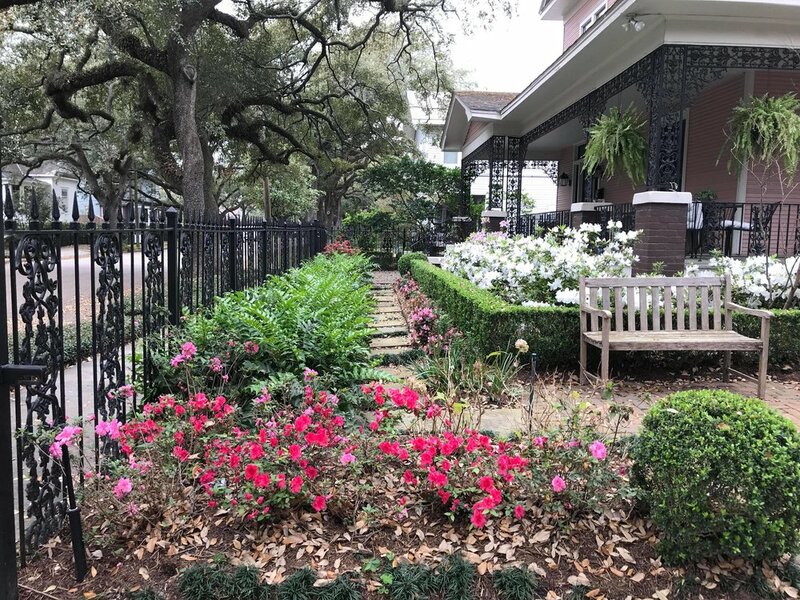 It's azalea season, and Mary and Brad Robbins' yard at 411 Bayland is blooming! Some of their bushes were thriving before they moved in nearly 30 years ago - wow! The massive, classic oaks nearly dwarf the Wilson four-square, and host resurrection ferns on their sprawling limbs. The effect is quieting. The shade across the front meant their landscaping had to transform over the years with their family, and was rebuilt in 1997 with design and construction help from Bill Salario, incorporating a brick kitchen garden, a 'Secret Garden' with fountain, and river rock. But the front porch has always been lined by the azaleas that don't seem to mind the shade. Raising a family of four boys meant creating spaces for them to play, including a long zip line, now replaced with a swing set for the grandkids and raised garden beds to take advantage of the sunshine away from the arching oaks. Around the pathways and stonework can be found gardenias, camellias, agapanthus, aspidistra, hidden ginger, ligularia, brunfelsia, maidenhair fern, and spider lily. A stone path with dwarf mondo grass leads away where Brad's plumeria collection enjoys the sun. Maximizing curb appeal in a cozy garden. 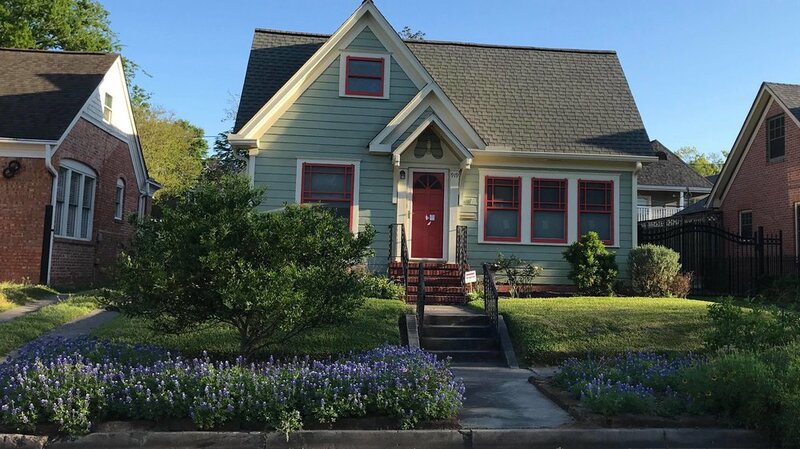 125 Payne is July's Yard of the Month. 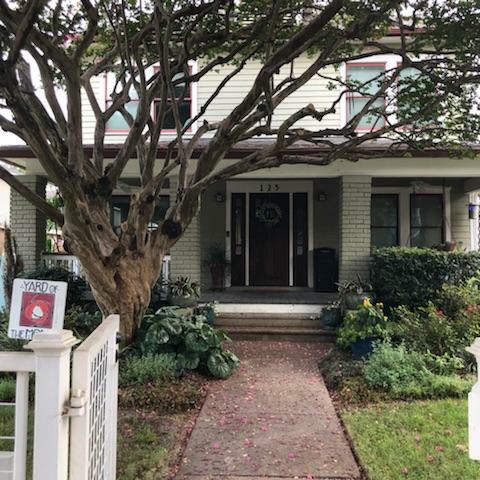 Lovingly maintained by owners Rachel Eddins and Mathew Zamzow, this compelling garden is nestled in the heart of historic Germantown, which features many beautifully maintained yards. What makes 125 Payne stand out from the rest is not just the way the front walk and historic porch are framed by the greenery from the featured crete myrtle, but rather, when viewing this home in the early evening, when the perfectly manicured beds are illuminated, giving a sense of warmth and welcome. 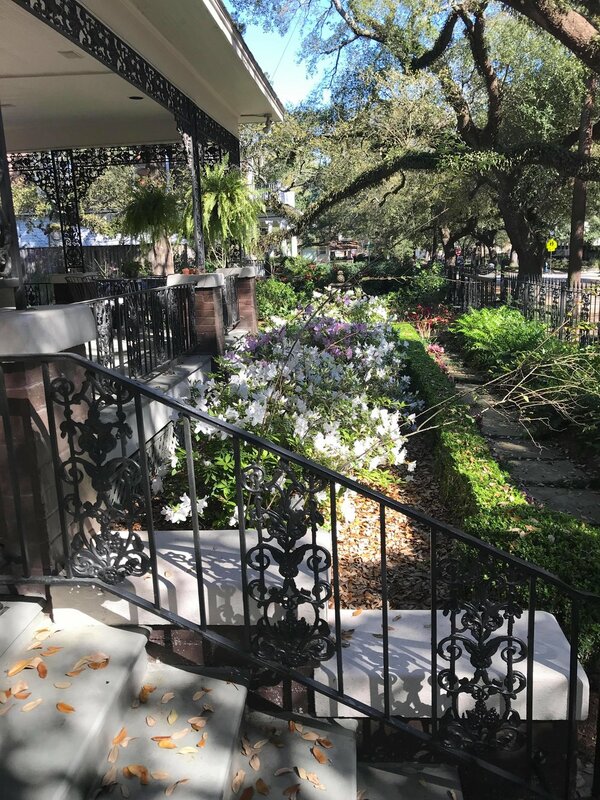 There is a lot to love about the yards horseshoeing our Norhill Esplanade: a jasmine arch, rose garden, two plank swings, flower-lined walkways, a Little Free Library, and little pops of color in yard chairs, yard art, and embedded in paths. But the anchor to all that you find here is at 1102 Euclid. Artist Elena Cusi-Wortham moved here in 1992, building her unique home that is also her workshop and an expressive space for her craft, social passions, and gathering place. 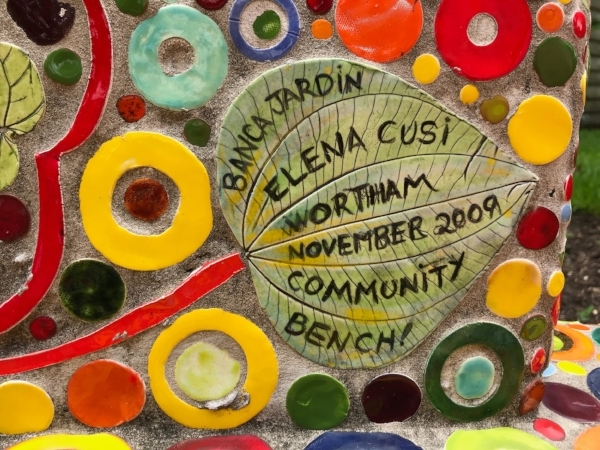 Her banca jardin is a lively community bench that draws children in to discover a handmade mosaic of nature's influences, which plays out all around the tile pieces. 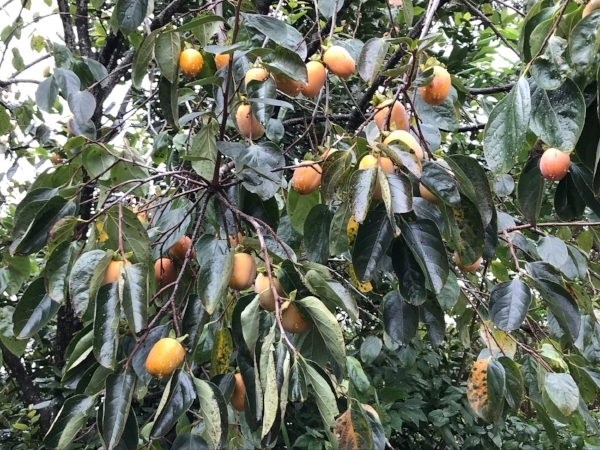 Throughout her L-shaped yard you will find plantings that are both practical and simply pretty: persimmon, fig, tangerine, and a bay leaf bush are useful. For shade and flowers: magnolia and ash trees, orchid tree, African daisies, Mexican olive, palo verde, and bottlebrush. 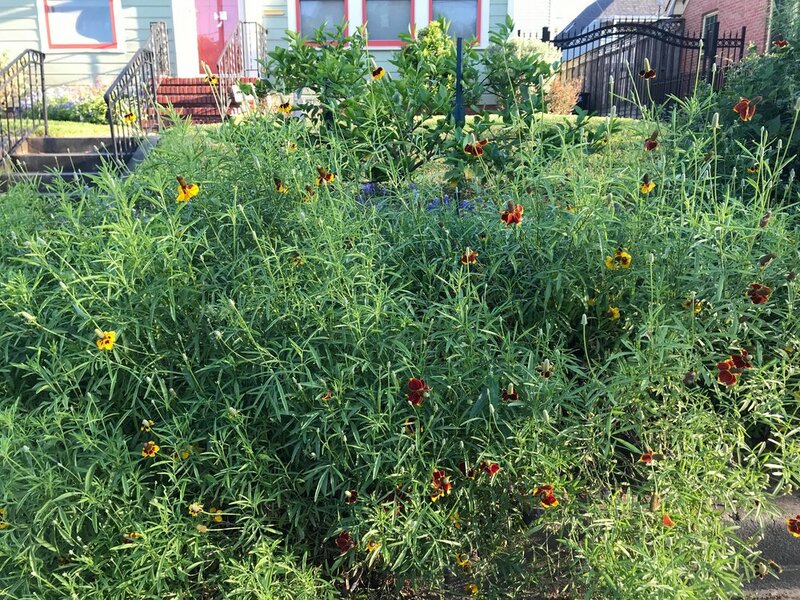 A raised bed forms an inversion of the arc in the bench, and has been a vegetable patch in the past, now home to milkweed, lantana, chives and more. 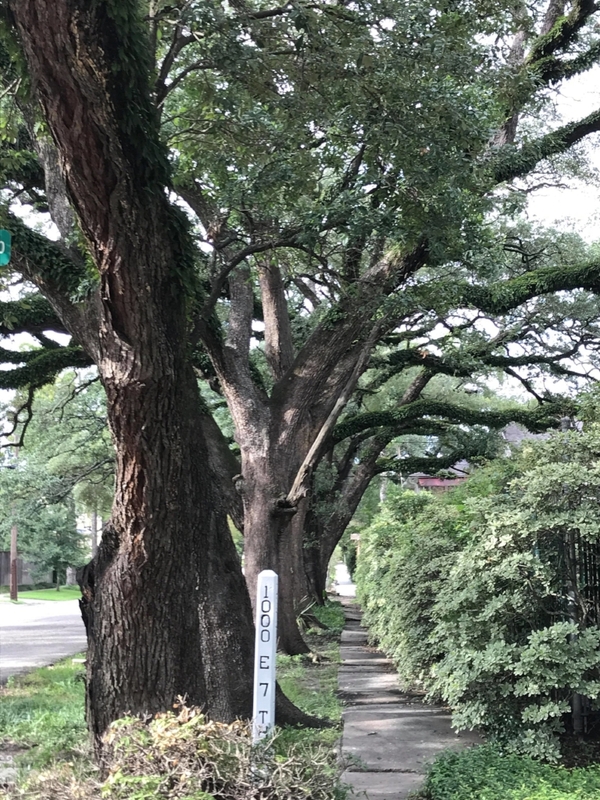 Elena's yard is a place of rich discovery for our neighborhood, but she has also shared her talents all over Houston, including four elementary school Spark Park and a Cotswold Project on Prairie St. downtown. She is currently working with the Community House on Avenue F and 72nd where she helps neighborhood children create their own tile mosaics, and discover art in nature. 802 Woodland Street, home of Janet and Harry Tallichet, is absolutely popping in our spring sunshine and showers! Janet is a "semi-retired" landscaper. Harry is a home builder and did the add-on to the original home in 2009. 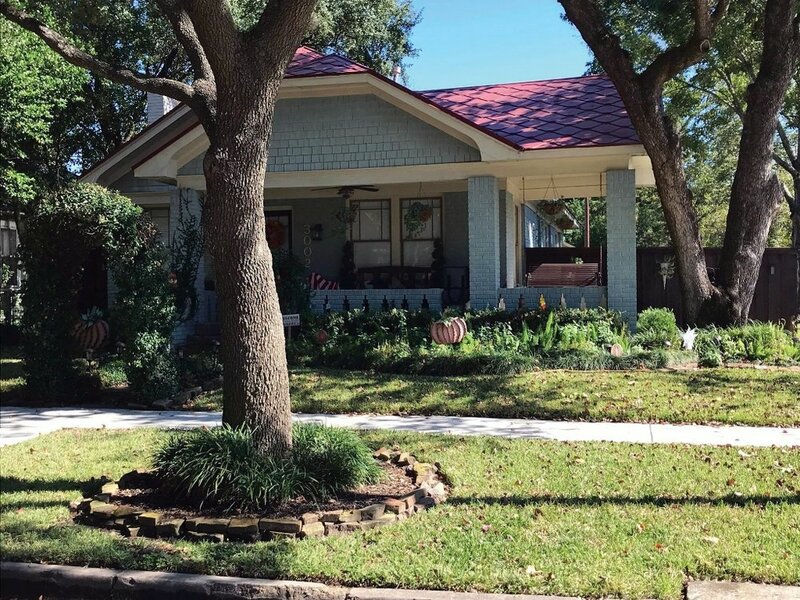 Moving from Memorial, Janet welcomed the chance to just play with a smaller garden in a neighborhood that didn't dictate plant material and minimum sod areas or maximum cutting heights. Her garden is for the birds and the bees and one dog, one cat. 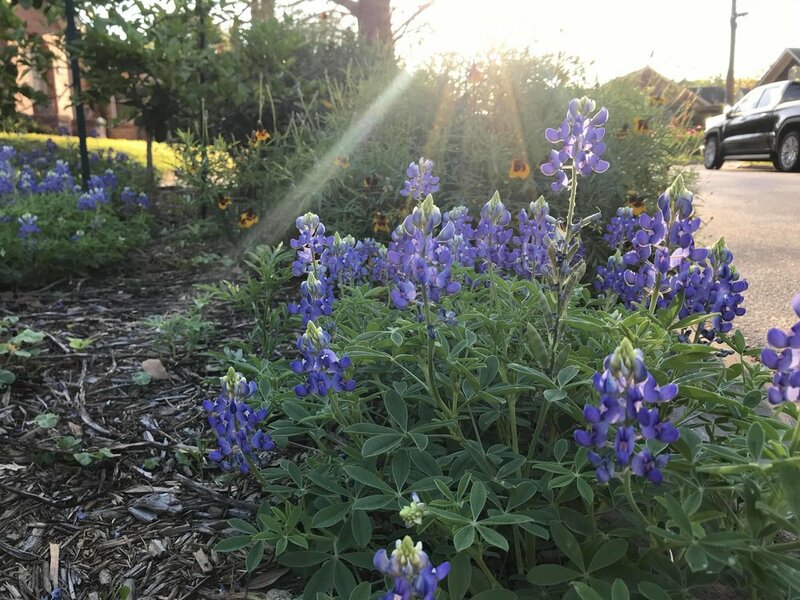 Always with natural habitat in mind, the garden has evolved through the years and Janet enjoys (in a mad scientist sort of way) experiments with wild flowers from Wildseed Farms in Fredericksburg, TX. 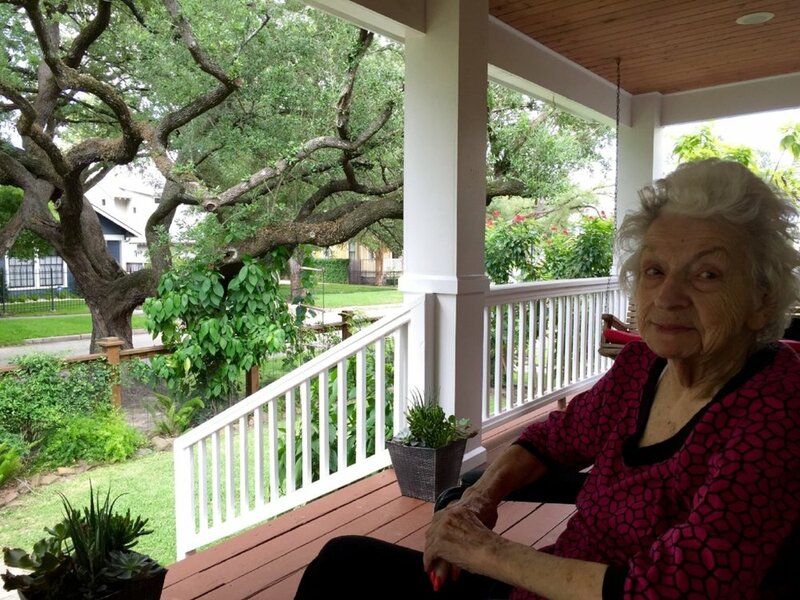 She hopes to encourage the love of nature and beauty to all residents. Nods to two also very lovely and playful yards nominated by neighbors: 711 Euclid and 506 Euclid. If you see a yard that you would like to nominate, please email me at beautification@woodland-heights.org. Hope to meet more neighbors out for walks enjoying our community - there is so much to enjoy here, especially this time of year. 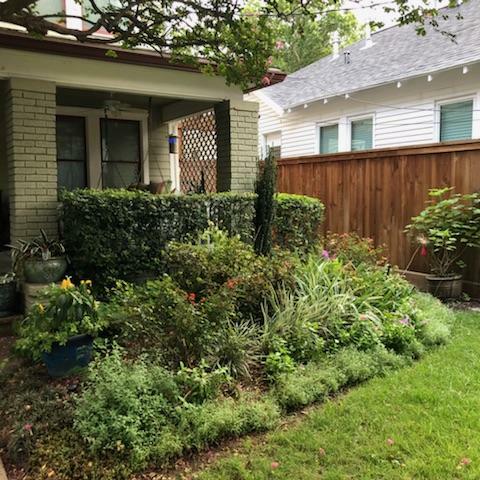 Yard of the Month goes to 1026 Omar St. This is a new house, with new neighbors, and a new kind of lawn that is gaining popularity in the Woodland Heights, artificial grass. The Woodland Heights has always been a diverse neighborhood where we celebrate and embrace different ideas. On my street alone, Omar, there are now 3 houses with front lawns made up of artificial turf. While most yards are looking pretty sad in our neighborhood after 2 hard freezes this month, 1026 Omar looks vibrant. Artificial grass has been growing in popularity because it doesn’t have to be mowed, and has the eco-friendly quality of not needing fertilizer or water. Lawns use 1/3 of all residential water consumption. Some of the new artificial grasses are even partially manufactured out of recycled materials. Craig and Katherine Vollmers, residents of Woodland Heights for over 18 years, get yard of the month for their corner lot at 404 Bayland. Although it is one of the few lots on lower Bayland with only one mature oak tree, it is rimmed with crepe myrtles. It has several lovely wisteria vines, Aztec grass, liriope, and azaleas for year round interest and color. There is also a beautiful mature sycamore tree in full fall color thanks to that dusting of snow the Woodland Heights received on December 8th. Beautifully done garden at Kurt and Jackie’s bungalow at 707 Wendel. The purple plumes if the salvia leucantha with it’s silver foliage is beautifully offset by several different native grasses and fox tail ferns. Lantana and moss rose add more color. 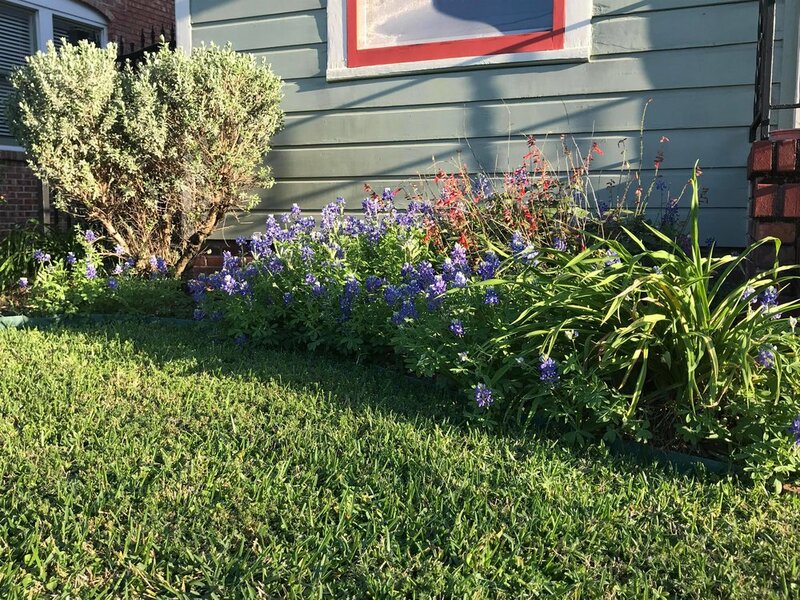 All of their plantings have low water needs which is perfect for our Texas heat. 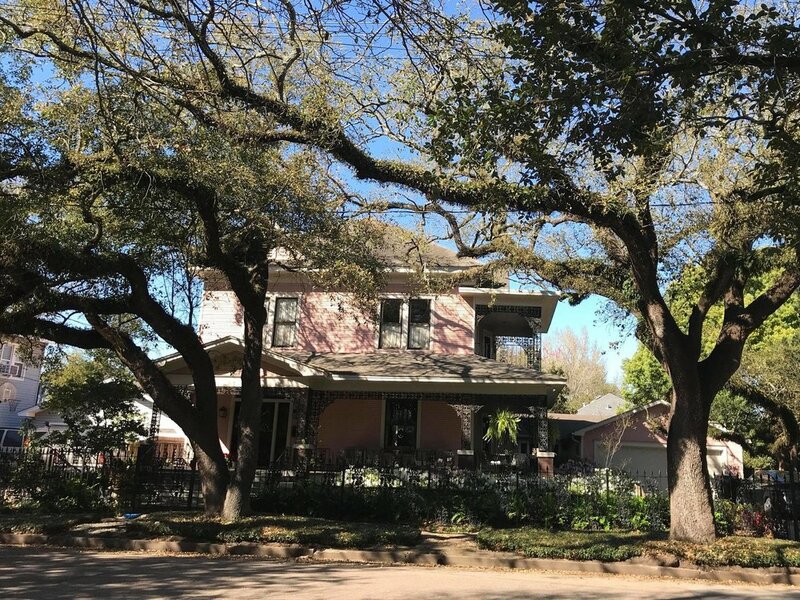 211 E Woodland Street located in historic Germantown is the yard of the month. The emerald green zoysia grass looks fantastic along with the thriving bur oak, liriope, ferns, Japanese maple, and boxwood hedges. The yard of the month goes to Donald Clay and his long time partner at 626 Omar St. These guys have been making this bungalows' garden beautiful for the last 22 years. Their emerald green lawn and perfectly manicured plantings are truly magnificent. Yard of the Month goes to Jane and Steve Ista who have been at 518 Byrne for 29 years. They have planted a lovely bird and butterfly garden edged in natural stones and you have to love that they went all out on the spider Halloween decorations. 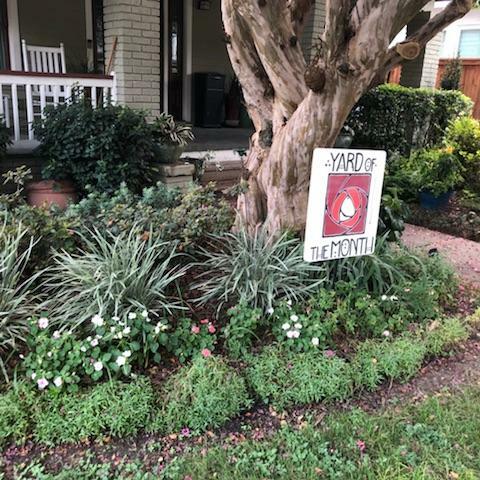 Yard of the month for September goes to Rose and Gregory Gallardo at 2320 Watson. They have done a beautiful job transforming this yard over the last decade. 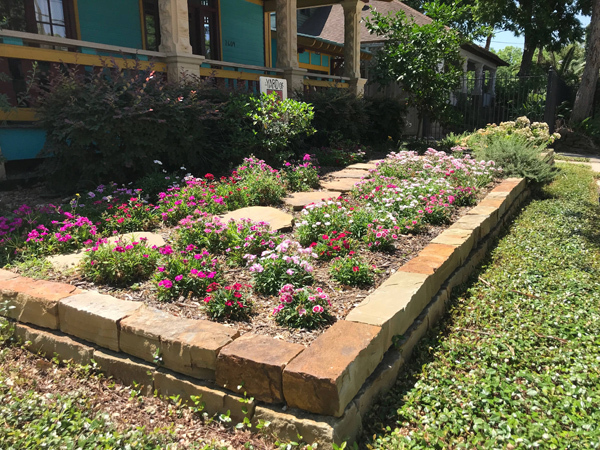 Lots of drought tolerant native plants and we all love the local Texas sandstone they have used to create boarders for the beds, a retaining wall, and pavers under the trees. 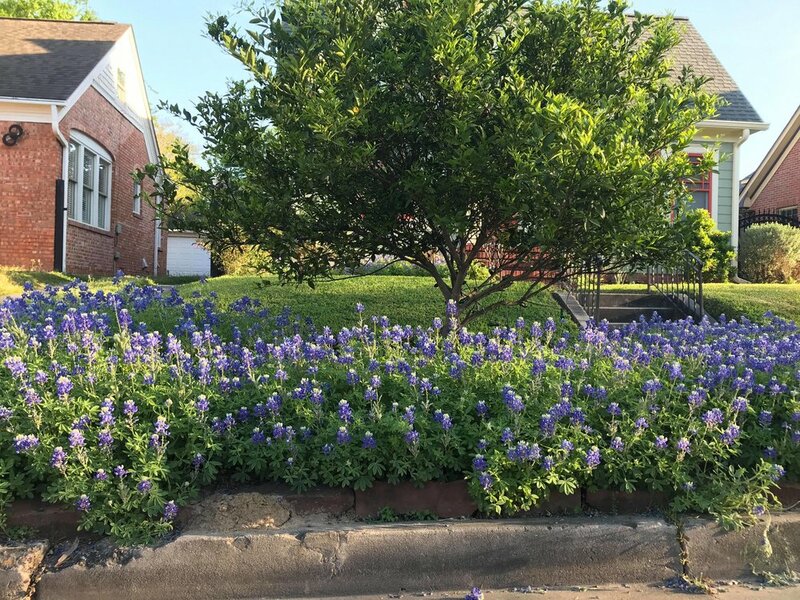 Keep up the good work and thank you for giving us such a beautiful yard to look at as we enter the neighborhood on Watson off of I-10. 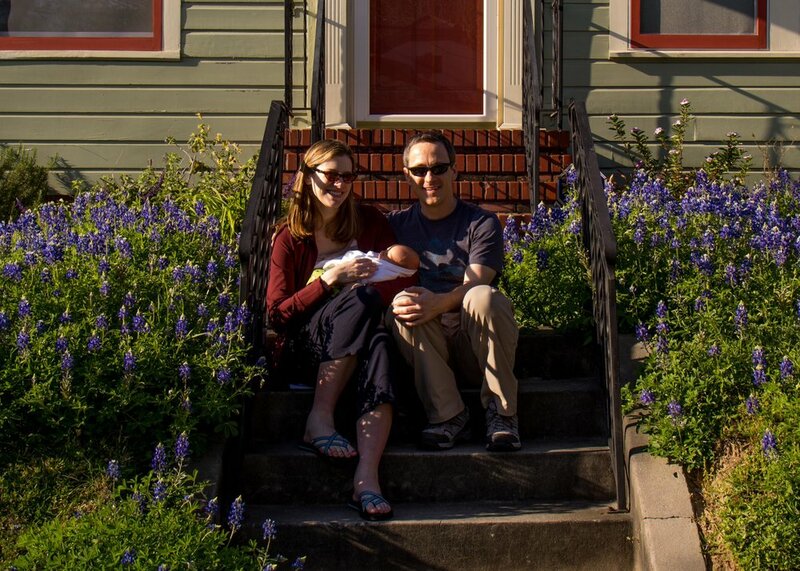 Yard of the month for May goes to the Forrest Family at 620 Omar. Their yard is a crisp, clean, traditional landscape with bright pops of red and pink which stand out nicely with their evergreens. Congratulations! If you have a recommendation for our next Yard of the Month please let us know.